In Victorian London a serial killer murders women. Pr Molyneux and bishop Archibald Soper are searching for him while suspecting each other. Magical, Chestertonian French farce. 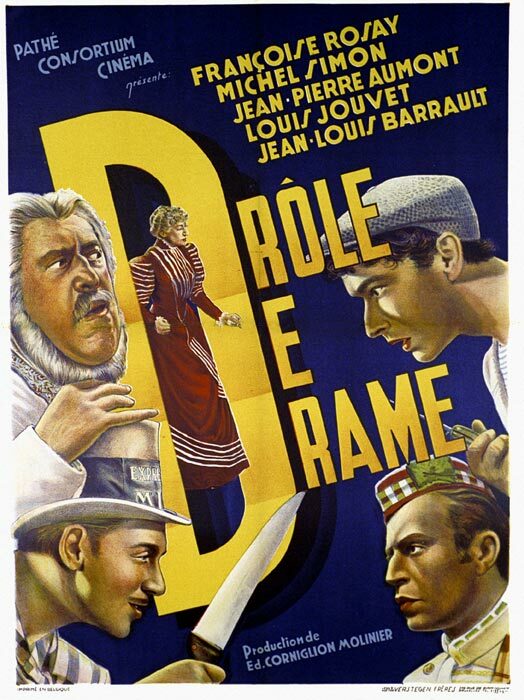 An absolutely wonderful Carne/Prevert jeu d'esprit that owes more to the modernist whimsy of a Rene Clair than the claustrophobic pessimism of their later works.Although acclaimed as the greatest exponents of poetic realism, films like QUAI DES BRUMES and LE JOUR SE LEVE can be seen today as flagrantly artificial, most especiallyin the sets and almost classical plots.Here, they let the artifice run riot, allowing plots run into strange digressions or non-sequiters.The sense of freedom absent from their more famous works is invigorating. Set in Edwardian England, Archibald Soper is a lecherous, hypocritical, poker-faced bishop who holds sparsely attended public meetings denouncing the evils of detective fiction, apparently an English 'craze' of the time. His cousin, Irwin Molyneaux, is a timid gardener married to a splendidly imperious snob, Margaret.He writes, unknown to his family, hugely successful detective novels under the pseudonym Felix Chapel, with plots pilfered from his maid's hyperactive milkman admirer, Billy. One day, Soper forces himself on the Molyneaux for dinner, but Margaret has exasperated her cooking staff too far, and they have vamoosed.Aghast at the potential humiliation of having no servants, she pretends to be visiting friends and cooks the meal herself.However, Irwin's ineptness at deceit leads Soper to report a murder to Scotland Yard. 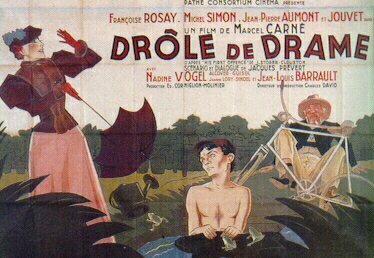 The film's starting point is the English fondness for detective fiction, and much of the film's humour, its sense of the absurd, its command of farce, its playing with appearance and class, gives the film an English comic eccentricity, rarely found in the French cinema.DROLE, however, is the complete opposite of the typical English detective novel, which offers an opening chaos and enigma, with the social disruption of a crime and a series of wildly disparate clues and leads, but achieves order and social restoration through the figure of the detective who can see, interpret and control everything. In DROLE, following Chesterton, say, rather than Conan Doyle, events start in relative order - characters are firmly set in their social positions. But as the plot proceeds, as characters are revealed to be leading double lives, as the profusion of secondary characters complicates rather than explicates the story, as events become more preposterous and unlikely, the social divisions represented by clear-cut spaces are blurred, and the film escalates into chaos represented by the mob, that great terror of the English, spilling into the narrative, destroying the respectable middle-class home, flouting and mocking the law, making its own judgements. The resolution, such as it is, is a complete lie, because there is no crime, and yet it is brilliantly subversive because it completely disrupts the duplicitous order at the beginning, it alienates people living convenient compartmentalised lives from themselves, forcing them to confront, if only for a moment, their true desires, which contradict their public faces, DROLE is ridiculously funny, and Prevert's arch theatricality has never been used to greater effect.Another plus is one of the most remarkable casts ever assembled - Michel Simon is immensely touching as the bemused gardener forced to abandon the comforts of his mimosa for the chaos of life on the run (private property being the conservative definition of self), Francoise Rosay is incomparable as the grande dame, besotted by social propriety, yet seething with untapped lust, the young Jean-Louis Barrault is a little callow compared to his seasoned elders, but endearingly impudent - the scene in the greenhousepond with Rosay is a mock-classical treasure. 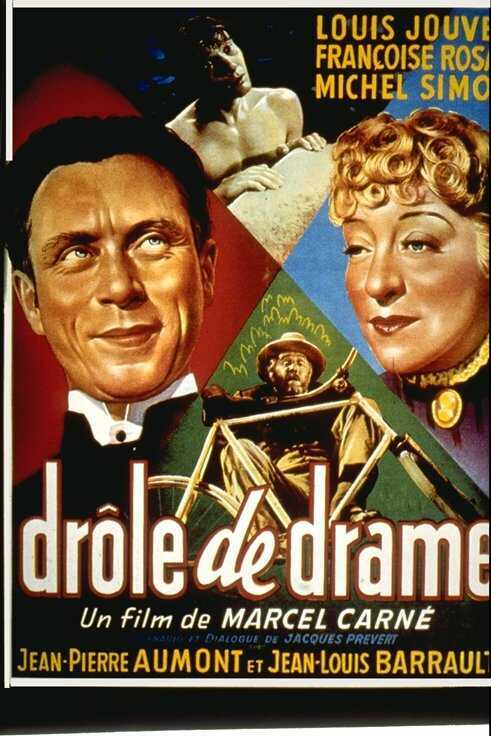 Standing out, though, is possibly the greatest French actor of the 1930s, Louis Jouvet, the funniest straight man in the film, keeping his gloriously calm poker-face through all kinds of humiliations and revelations, including the donning of an elaborate kilt to find an incriminating picture from an 'actress'.Best of all is Carne's style, completely unrestrained, unafraid to go for 'gag'-like effects (the mugging of dandies for buttonholes is particularly piquant), beavering through fairy-tale sets that do for London what TOP HAT did for Venice, completely at ease with the farce, yet still pulling off evocative shots that reveal the emotional reality behind the nonsense.